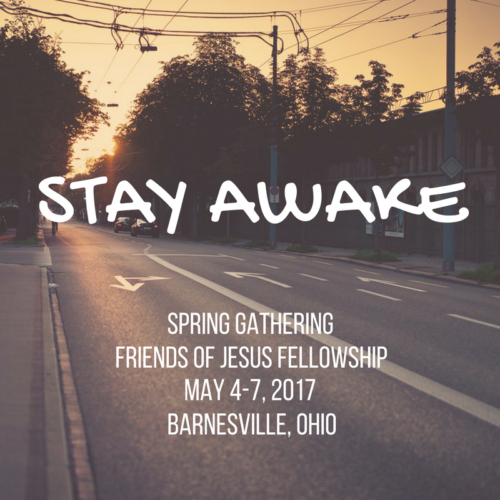 This past weekend the Friends of Jesus Fellowship gathered in Barnesville, Ohio. Our theme was “Stay Awake” – drawn from the teachings of Jesus to his sleepy disciples. Even 2,000 years before cell phones, streaming music, cable news, and video games, it was hard to stay awake. The original Jesus community struggled to stay conscious, aware, and focused on the things that matter. Even when Jesus was with them in the flesh, teaching and leading them, it was a challenge to stay grounded. Peter, James, and John couldn’t even stay awake with Jesus for one hour while he prayed in the Garden of Gethsemane! When Jesus was arrested and hauled off to be executed, every single disciple fled for his life. Just hours before, they had all insisted they would die rather than abandon Jesus. Now where were they? The first disciples struggled to stay awake and responsive to Jesus’ voice, but it seems like we have an even greater challenge. While the twelve apostles knew Jesus as a man, we today only know him through the Spirit. It’s easy to lose track of who Jesus is in our lives. It’s easy to forget that he’s even real. In the midst of so many worries, comforts, and distractions, most of us operate in a state of practical atheism. This is certainly true for us in the Friends of Jesus Fellowship. We’re all tired. We get get our priorities mixed up. We lose track of who Jesus is and where he’s calling us. Like Martha, we are worried and distracted by many things. But we need only one thing. Our time together in Barnesville was a reminder of that one Life that gathers us together. We reconnected with the still, small voice of Jesus who speaks to us when we’re ready to listen. We are part of a Spirit-led community that draws us out of distraction and into a more true and beautiful world. It was a joy to have several families at the gathering, and to care for one another’s children. We watched them play together as friends in the family of God. Our young ones reminded us that we are all part of a larger community of friends. We’re knitted together in the love of Jesus. I’m very grateful for the grounding and sense of place that I find as part of the Friends of Jesus Fellowship. Coming back home to Washington, DC, I need to remember that sense of connection and purpose. The distractions have not gone away. I spent four days unplugged from electronics, but my screens were waiting for me as soon as I left the gathering. It’s easy to wish for a simpler, more innocent age. People have always longed for that, regardless of their circumstances. But I’m not called to that kind of nostalgia. 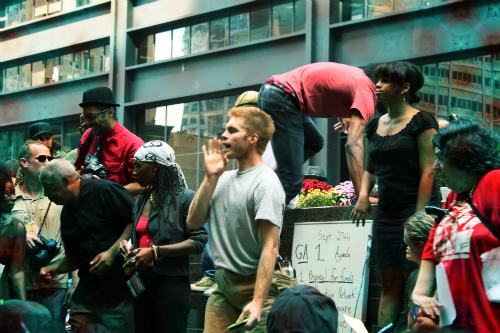 I’m wondering how I can embrace an abundant, Spirit-filled life in the midst of urban America. My challenge now is not to remove distractions, but rather to repurpose them for good. How can I use technology to foster greater faithfulness, connection, and resilient community? Rather than distract myself, how will I connect and focus? I need more signal and less noise. How do I get there? More importantly, how do we get there together? The industrial revolution colonized my faith, and I never even knew it. For so much of my ministry, I focused on doing things for God. I’ve been like a child who takes a toy their parent has given them, and returns it to the parent as a “gift.” One of the first revelations I received from God was that I own nothing. I can’t produce anything under my own power. Yet my response to God’s action in my life has always been about creating return on investment. It’s so hard to receive a gift without providing anything in return. As a pilgrim in the north of England in 2005, I experienced something life-changing. It was an anointing by the Holy Spirit. God touched me in a way I’ll never be able to describe. I felt resolute clarity that God had called me into a life of service to him. I thought I was ready to give up everything. My first response to this amazing encounter was to dream of evangelizing Europe. I find this embarrassing to recall. Not because Europe (or America) aren’t in need of the gospel. That’s a mission I’m still excited about. But the idea that I, as someone who had just received the Holy Spirit and who hadn’t even read the New Testament yet… It makes me blush. In truth, I needed people to continue evangelizing me. I was a baby in Christ, and I needed spiritual parents – not to start a family of my own! It’s fortunate that I listened when God guided me to enroll in a small Quaker seminary in Indiana. I spent several years studying the Bible, Quaker/Christian tradition, and the practice of ministry. This was crucial. My time in seminary broke me open in a lot of ways. I learned to listen more. 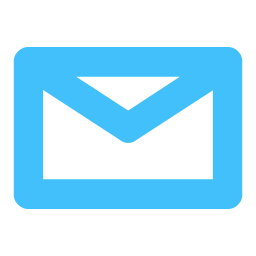 I submitted my sense of personal inspiration to the discernment of a wider community. I grew in maturity and patience. But my production-oriented, industrial mindset remained largely untouched. My ministry was still centered on what I could do for God, rather than simply receiving the gift. My focus was on how to engineer tangible results that the world would recognize. I ended up transferring my desire to do something for God into a desire to do something for the Quaker movement. I was on fire for Jesus and his kingdom. And I knew that the kingdom of God is one of unmerited love and grace. But I wanted to merit it. I wanted to build the kingdom of God with my own two hands. I wanted to be a successful minister, like my heroes from the Bible and Quaker history. More than anything, I wanted to be a minister after the mold of Paul and George Fox. An apostolic movement-builder and church-planter. A charismatic leader who could break open whole new frontiers for the gospel. A man whose faithful preaching and example lays a foundation for community. It would have been one thing if I had merely burned to be faithful. It would have been beautiful if my dream had to been to use the gifts God gave me to bless others. To show God’s love through my actions, to be a servant like Jesus. But I wanted more than that. I wanted more than Jesus. I wanted results. I wanted to be measurably successful. I wanted to hit those successful ministry benchmarks as defined by the early church and the early Quaker movement. I wanted to win. The spirit of this age, of the market, of industrial capitalism, was so strong in me, I never even recognized it. I gravitated towards materials from the Evangelical world. They promised to teach me how to be more successful, more productive. I, too, could have an earth-shaking ministry just like George Fox. I could turn stones into bread and throw myself from the top of the temple. Nothing would be beyond me. It was all a lie. No matter how much I studied the work of other ministers and applied their techniques, I never saw the kind of results I was seeking. The communities I served stayed small. I couldn’t support my family with the income that my various projects brought in. My wife and I grew burned out. Our shared ministry was beginning to feel like a revolving door of failure. The image of ministry success that I dreamed of had turned into a nightmare. And so, at a certain point in the fall of 2014, I gave up. I was finally exhausted enough to face the truth. My dreams disconnected from reality. My aspirations seemed to be running against the grain of what God was asking of me. I had no idea what God wanted, but it wasn’t this. I’ve spent the last couple of years in the wilderness. I’ve backed away from full-time ministry. I’ve taken on full-time, secular work. I put my time and attention into family, career, and the nuts and bolts of making a life for ourselves in this city. I’ve found friends and activities that have nothing to do with any sort of ministry objective. This is new. These have been hard years. It was painful to step away from the work that had defined my life so completely in my twenties. It was disorienting to release leadership and allow my communities to fall apart, lie fallow, or morph into new configurations I hardly recognized. These last few years have felt like dying. But I’m thankful. These wilderness years have been a dark blessing. Through the pain and confusion, God has been scouring out my insides. He’s challenged my industrial, results-oriented mindset. The Holy Spirit has hollowed me out and broken me. I won’t say I’m healed. I won’t say it’s over, or that I’ve figured my life out. There’s nothing that definitive. I’m living in a not-knowing that is powerful in its ambiguity. I’m living in the desert of the Real, and all I have to guide me is the hope that God will lead me, even if I don’t know it. For the time being, I don’t want to do anything for God. I also don’t want to do anything for principle, causes, or movements, either. Any positive impact I make, any real joy I experience, is going to come from doing things for people. Not an abstract idea of people, but the flesh-and-blood human beings who live in my neighborhood, joke with me at work, and share my commute. My ministry field is the brothers and sisters that God has placed in my life. My measure of success is the joy, generosity, and love that I bring into theirs. Maybe someday I’ll be part of something big. But that’s up to God. Until then, I’m excited to see what small can do. Do You Think You’ll Age Like Wine? I came to religion for selfish reasons. I was often depressed. I felt empty. I couldn’t find meaning in life. I explored faith because I wanted to receive, not to give. I was looking for a spiritual solution to my lack of direction and purpose. I wanted a faith that would make me feel good. I did a lot of religious exploration before I became a Christian. I engaged with philosophical movements like existentialism. I went deep with political ideologies like democratic socialism and anarchism. I even explored Buddhism, Islam, and other non-western faiths. My motivations were very human and self-centered. I wanted a faith that would fix me, that would make me happy and fulfilled. I wanted a system that could give me the right answers and make my life easier. If I’m honest with myself, most of my faith journey has been a path of self help. My religion was like those books that promise rapid weight loss, financial prosperity, or success in love. Everything was about what I needed, wanted, and craved. Even my experience of God was a product to be sought after. Buddhist books written for westerners promised me inner peace and clarity. Quakerism offered me ecstatic, mystical experiences that took place in meetings for worship. That sense of presence and power made me feel special, purposeful, and loved. I wanted more of that. I felt like these religious experiences were making me better. Throughout my twenties I would say, “every day is better than the last.” And it was true. The more I got into spiritual practices and religious devotion – meditation, Bible reading, worship, prayer – the more mature and grounded I felt. Other people seemed to think so, too. I had objective evidence that religion was making me a better person! My faith was fun and gratifying. It was fantastic to feel successful. My life was filled with meaning and purpose in a way that I had never experienced before. I still had periods of darkness and struggle, but I came out of each one feeling more triumphant than before. My thirties have been a hard decade. I had my whole sense of mission and purpose called into question. The ministry that I’d been focusing my whole life on fell apart. It was hard to know what to do. I felt so clear about what God had called me to do. And then there was nothing left. Where was God in all this? At the same time, my life turned upside down. After years of ministry, I started working full-time in non-church-related jobs. We also had our first child, which changed my life and outlook in ways that I never imagined. Life got busy. Full with comings and goings, work and responsibilities. I didn’t feel able to be present to God in the way I used to. I felt that emptiness again. This new dry season is very different from the one I experienced in my teens and early twenties. This time, I’ve already committed to a religious path. I know that I want to follow Jesus. I’ve met him. I’ve seen that he is the Messiah. For me, he is the Way, the Truth, and the Life. And yet I’m so burned out on religion. I’m so exhausted by church, theology, and all the human stuff that goes with being in faith community. Religion doesn’t feed me in the way it used to. As hard as this is, I’m wondering whether this might be a good sign. What if I’ve been mis-using religion this whole time? What if my relationship with God isn’t about making me a better person? What if it’s not about giving me purpose, identity, or comfort? What if my faith in Jesus isn’t about me at all? Maybe these questions seem obvious to you. “Of course, Micah. 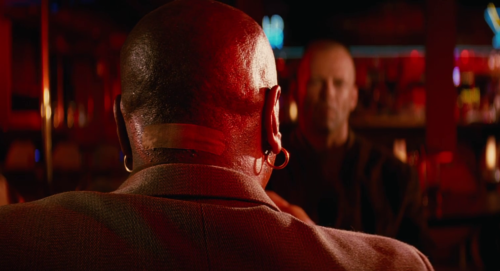 What, you thought it was all about you?” In truth, I’d have to answer in the affirmative. That’s the whole narrative I’ve received about faith. It’s about self-improvement. Growing in maturity. Becoming a better man, able to help and teach others because I’ve got it together. That’s what I thought “sanctification” was all about. But now I’m thinking there might be a different story. To put it in Paul’s language, what if I’ve been a baby drinking milk this whole time? What if God gave me what I needed in my very immature state, but it’s not the main course? What if the meat and potatoes of discipleship is less about improving myself and more about forgetting myself? Could it be that, by seeking life improvement – even by desiring to be “a better person” – I’m avoiding the real journey that Jesus wants to take me on? Honestly, I don’t know. I think it has to do with looking at Jesus rather than myself. I suspect it’s about learning to focus on the needs of those around me rather than my own dreams and desires. Even good dreams and desires. It might be that the kingdom of God isn’t about what I experience. It’s not focused on how I grow, or what I do. Instead, it’s unlocked when I lose track of myself. When I become yielded to the light of Christ. Even when that light feels like darkness. This is a scary path. It’s frightening because I have no idea where it leads. To walk down it is to surrender my ability to steer. 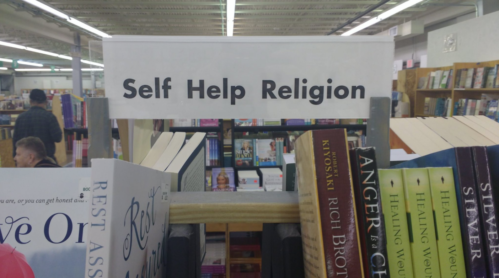 This is what it means to get past “self-help religion.” When I get into the strong meat of faith, the overwhelming sensation is that of being out of control. Yet there is also the hope here. Hope that, in the midst of it all, I am loved and guided. There is a presence and power beyond my narrow understanding and selfish desires. She will direct me. I want to trust this Spirit. I want to trust that this path will lead me through green pastures and beside still waters. Even if I’m thirsty most of the time. What If This Is The End of the World? Christianity is a wine-soaked religion. My teetotalling Quaker ancestors did their level best to rid the world of alcohol. Still, the pages of the Bible are full of references to the drink. Jesus’ ministry began and concluded with celebration. He kept a wedding party going strong into the night when he transformed water into wine. And when his time on earth was almost up, Jesus enjoyed a simple passover meal with his disciples. He offered them bread as his body, and wine as his blood. The Hebrew scriptures say that the life of a creature is its blood. What is wine, that Jesus would offer it to us as his life? Wine is a mysterious drink. It breathes, ages, and develops over time. Even before Jesus made it a centerpiece of the Christian faith, wine has always held a religious significance. It has a life of its own. One very interesting thing about wine is the unpredictable way it ages. It is well known that good red wine can improve dramatically over the course of several years in a cellar. What’s less commonly known is that this improvement is not always linear. A young, bold, and aggressive wine can mellow into a refined, coordinated vintage. But open it too late, and it may have turned to vinegar. Open it too early, and it may not have the qualities you expected at all. In the midst of all this change, there is often a “mute” period. Between the boldness of youth and the sophistication of age, the wine falls silent. If you happened to sample it during this time, you would certainly be disappointed. But wait a little longer, and you may experience a masterpiece. Jesus himself is like wine. We experience the boldness of his teaching, healing, and rebuke to hypocritical leaders. We witness the glory of his resurrection, the power of his triumph over sin and death. And Jesus also passes through a mute period. Between the last supper and the resurrection, Jesus falls silent. As he stood before the High Priest, he said almost nothing. Only enough for the religious tribunal to condemn him. Then he was taken before the Roman governor, Pontius Pilate, who was astounded at how little Jesus had to say. It was as if Jesus’ fierce boldness and righteous anger had slipped away. As he hung dying on the cross, the silence was deafening. There was no dynamic action. No sermons or healings. Angel armies did not come to the rescue. Instead, Jesus turned inward and directed himself to the God who felt so absent right then. He showed love to a fellow condemned prisoner. He consoled his disciples and his mother. Jesus’ whole life was churning in the vortex of this “mute” time. Jesus had been faithful, and something amazing was about to happen. But as Jesus drank the muted wine of that moment, all he could taste was gall and vinegar. In both wine and human life, this muted space is awful, mysterious, and necessary. Wine must lose what it once was in order to become what it is meant to be. Our lives must pass through brokenness and surrender. The loss and emptiness of the cross is the only path to a resurrected life. You may be living through a muted moment in your life right now. You feel empty, shorn of the enthusiasm and excitement that once propelled you. There’s a gentle brokenness in you. It invites silence. Grounded humility comes unbidden as you repent in dust and ashes. There is peace here. Now is a time to wait. There’s no need to open that bottle before it’s ready. Like any good wine, your life is breathing, opening. You are an unfolding mystery. Can I Be Happy Without Progress? If Humans Are Basically Good, How Did We End Up with Trump? When I first became a Quaker, I assumed that the Friends tradition endorsed my existing liberal, secular worldview. I believed that all human beings were basically good. All of us want to do the right thing, after all. We just need resources, love, and support to grow in a healthy direction. The more I learned about the theological underpinnings of the original Quaker movement, however, the more uncomfortable I became. It seems that, when George Fox spoke of “that of God in everyone,” he wasn’t referring to a divine spark innate to each person. He was speaking of the imprisoned presence of God within the heart of a depraved humanity. Depravity. It turns out that the early Quaker movement had a lot more in common with Calvinist Puritanism than it did with modern theological liberalism. Rather than viewing humanity as basically good, but in need of a little bit of TLC, the early Quakers taught that humanity is fundamentally selfish, broken, and in active rebellion against God’s love. The place where Quakers parted ways with the Puritan doctrine of “total depravity” wasn’t the “depravity” part. Quakers took issue with the idea of “total.” For George Fox and the fiery preachers of the early movement, it was axiomatic that humanity is lost in darkness and separated from God. It’s obvious that human beings often choose our own selfish desires over love for others. Anyone who is paying attention knows there is something terribly wrong with us. 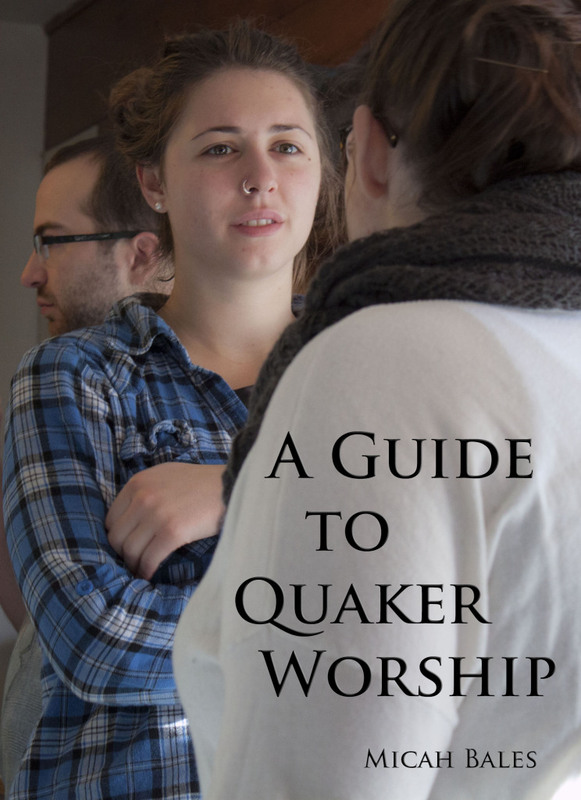 What set Quaker teaching apart was its emphasis on the inward Light of Christ. Quakers preached the saving power of God, present in/with the Creation. This loving presence can redeem even the most wicked and hateful person. Calvinists argued that God sovereignly redeems only some people, and predestines the rest to damnation. Quakers insisted that all people receive an actionable offer of salvation through the indwelling presence of Jesus in their lives. Why does all this matter? Why am I dredging up centuries-old theological debates, using language that is, at best, opaque to many readers? Strange as it may seem, I believe that the concept of depravity is vital to the experience of the church in the West today. Much of the progressive Christian community – along with our liberal secular counterparts – has held to teachings about human beings that are just plain wrong. Just as I once believed that human beings were “basically good” and that we just needed a little extra support to reach our potential, much of the western church has imagined that human thriving was just a matter of technique. With enough education, technology, and economic justice, we could achieve the kingdom of God. The moral arc of the universe would bend its way towards justice. This faith must now be irrevocably shattered. Many of us closed our eyes to the violent injustice of the United States under the Obama administration. Almost all of us fought less urgently for justice than we feel compelled to now, in the wake of the 2016 election. With the rise of a proto-fascist, white supremacist regime, it’s harder than ever to maintain the fiction of a “basically good” humanity that just needs a little bit of encouragement. It’s time to reclaim a recognition of human brokenness, sin, and separation from God. We can’t ignore it any longer. It is manifestly evident that we are not what we ought to be. Neither technological prowess nor economic gains seem likely to alter that equation any time soon. Something is wrong here, and we must look deeper than ever before if we are to come to terms with it. Self-examination is in order. It would be easy to take the idea of human sin and selfishness and merely apply it to others. There is a temptation to take all of our fear, fury, and disappointment and project it onto those who supported Donald Trump in his bid for the presidency. It would be all too easy to scapegoat them, allowing them to absorb all of our culpability. But a recognition of human depravity is no cheap trick we can use to absolve ourselves of guilt. Any attempt to turn ourselves into heroes and others into villains would be a lie. If we are to live in the truth, we must begin with the devastating realization: You and I are ourselves depraved. We are liars, self-seeking, potential murderers. We are dishonest with ourselves and others. None of us is exempt from the reality of human depravity. You and I engage in the very same kind of tribalism that we recognize in others. Most of us were quite willing to overlook the sins of the Obama administration. We have been complicit in the war machine and surveillance state that Mr. Obama helped to perpetuate. In the same way, most of Trump’s supporters are prepared to ignore the dishonesty, violence, and outright narcissism of their chosen leader. I am not better than Trump’s supporters. It may be that the policies and philosophies that I advocate would have a better effect on the world if enacted. But my fundamental motivations for advocating them are not so different from the motivations of my enemies. Please don’t misunderstand me. This is in no way an excuse or apology for the truly evil regime that is now in power in the United States. God judges wickedness, and this is almost certainly the most wicked administration in living memory. So where do we go from here? How do we emerge from this pit of depravity and engage with the world as it is, not as we wish it were? When I first became a Quaker, I thought we were an optimistic faith tradition. But I’ve come to realize that there’s a big difference between optimism and hope. We can no longer indulge in the cheap optimism that tells us that we’re good people and everything is going to be alright. Our need for hope has never been greater. As friends of Jesus, we are called to live in the hope of redemption. As lost and depraved as we are, there is a life, power, and presence among us that can restore us. Heal us. Bring peace where now there is only struggle. This peaceable kingdom is real. We are called to it, and with divine assistance we can inhabit it together. But we can only enter this kingdom once we have shed the illusion of our own goodness, piety, and self-sufficiency. There will be no “good people” in this kingdom – only repentant sons and daughters who have come home once again, having squandered our inheritance. The kingdom of God is gentle, a place of thanksgiving and joyful tears. I want to join you there. To do that, I need to recognize my own brokenness. I need to acknowledge all the ways I’ve prioritized myself over others, all the ways I have been dishonest in pursuit of my own desires and objectives. I want to meet you in the kingdom where the last is first, and the first last. Even if that means that I end up being at the end of the line. This revolutionary new reality plays out in love for enemies. We find it when we choose relationship and trust rather than money and self-interest. It comes alive in the healing power of forgiveness and the daily practice of justice. The freedom of the gospel looks like insanity to middle-class, safety-conscious America. For those of us who are a wrapped up in the world’s priorities, the simple act of forgiveness looks like weakness. 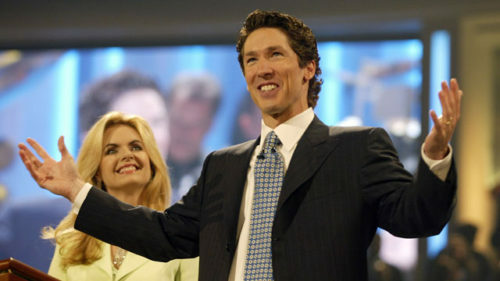 The Christian’s refusal to take refuge in wealth and privilege seems like adolescent silliness at best. At worst, the humble-yet-prophetic way of Jesus can activate the defense response of those in power. Violence. The emperor does not like being told he’s stark naked. My years as a Christian have been filled with a sense of longing. I’ve yearned for the revolutionary days of the early church. I’ve looked back to the fiery, apocalyptic campaigns of the early Quaker movement with admiration. And I’ve wondered: What must we do to ignite this kind of movement in our own time and place? What must I do to be part of God’s continuing revolution? I know a lot of other people are experiencing this same yearning. We live in frustrating times. Stuck times. Times in which we all find ourselves longing for upheaval and change. I hear words like “revolution” being thrown around a lot. In Christian circles, the word “revival” is often a popular choice. Heck, even I’ve used this word once or twice. Quakers and Christians of all stripes throughout the world are longing for revival – the restoration of that movement-church fire, the Holy Ghost power of a people gathered by God to be Jesus’ hands and feet in the world. It’s a beautiful vision. It’s the right vision. And it’s a vision that we are completely unprepared for. I’ll be completely honest: For a long time, I’ve blamed God for the lack of transformation in my own life and in the communities where I’ve served. I’ve been baffled at the lack of forward momentum, Spirit-led change and healing despite how much I and many others have prayed for it. Looking back to the miracles of the early church and the prophetic Quaker movement, I’ve been perplexed. If God could do that in the first century and the sixteenth century, why won’t he do it now? Why doesn’t Jesus send the Holy Spirit like he used to? I’m seeing now that I’ve been wrong to blame God. The Holy Spirit is alive and ready for action any time we call on her. God isn’t the problem. I am. We are. We’re not ready for the spiritual revolution we dream about, precisely because it is a dream. Far too often, our ideas of revival are a fantasy of spiritual highs, supportive community, and connection with God. But when’s the last time you fantasized about losing your home, your bank account, your sense of security? Does your imagined revival include beatings, persecution, and social ostracism? Does your vision of the beloved community involve sacrificing career, enduring hardship, becoming a community that our culture laughs at and punishes? Lots of Christians talk a big game about revolution and revival. (I myself talk about both.) But it’s all a delusion if we aren’t ready to embrace the cross, the sacrifice that comes when we choose to be friends of Jesus. I’m weary of all our talk of revival – I’ve gotten fed up with my own words! You and I have no business talking about revolutionary transformation of our society when we have yet to take seriously Jesus’ call to repentance. The whole Christian movement is founded on the idea that we must profoundly change our way of life. If we think that we can follow Jesus but keep our toys, our security, our status, and our noble conceptions of ourselves, we’re going to be very disappointed. I know I have been. How much longer will we chose to wander in the wilderness of conformity to the 21st-century capitalism, self-centeredness, and the world’s conception of what’s important? How long will we refuse to let go of our dreams about community and embrace the real relationships that make the church a revolution – not a club? When will the numbing effects of our opiate religion make us so nauseous that we resolve to sober up rather than choking on our own vomit? Jesus has told us time and again that the way to life is narrow. The passion and beauty that we admire in the early church and other Spirit-filled movements has always emerged from sacrifice and struggle. Until we repent – until we turn away from our involvement in the consumer-capitalist war machine and all its false promises – we will never be that community we dream of. But if we do embrace this challenge, Jesus has promised us life, real life. Gathered in his victorious and comforting Spirit, revival is possible.